The Hat site has sprung back in to life for those who have not visited it in a while, worth a look. Anyway, lots for us to influence , crowdfunding for the British dragoons, and we are being asked for views on ACW figures, Napoleonic Austrians / Hungarians , plus what we would like to see made next. Good to see life being breathed back in to Hat, so take a look for yourselves. For anyone who was disappointed that the HaT Peninsular War Light and Heavy Dragoons turned out to be 28mm, there's a chance here to get the sets made in 1/72 (link below). If anyone here wants to support this project then thanks from me for helping to get them made so I can get my sets . zulu`s 1000`s of em wrote: The Hat site has sprung back in to life for those who have not visited it in a while, worth a look. . The HaT forum was once a very good place to talk & exchange ideas in a civilised atmosphere. It's good to see it stirring back to life. I don't game the Peninsular War but I wish you who do luck with the British cavalry. HaT are sure to please. Not sure what you mean by 'free forum' Paul, I didn't pay to join it and I've never been invited to make a voluntary contribution. And you don't actually need to register to post there you can post freely as a guest. The forum IS run and payed for by a manufacturer, like the Strelets forum. it's the manufacturers interface with their customers and the focus is, obviously, on their products. It's the place to go to find news about their sets and make suggestions on how you think new sets should be made. Because people were getting into stupid but entertainig fights over nothing much the old forum introduced a lot of rules about what you could post. Which I thought was unnescessary but that's the way it was. On the new forum the 'General' section says "You can talk about anything here" and, so far, I haven't been censored for mentioning Strelets or Benno's or any other non HaT subject. For instance someone asked where he might find mule train figures and I posted a ridiculously long list of other manufacturers products with PSR links and that wasn't objected to. The forum is as free as I think it needs to be but it is a manufacturers forum and it doesn't pretend to be otherwise. For a forum that's not connected to any particular manufacturer I recomend Benno's . Errrrr, if you check the forum you will see that all I got was a like. Oh and a one man band he is not. There appears to be several moderators. The new hat forum came about as a result of increased cost and limited storage capacity on the old one, so free to use not free to own. I too preferred the older format easier to find and read new posts, but thing change and that is life. The mods are just that moderators with the limited capacity to remove posts if needs be, and then usually the posts in question are from Trolls. But my original post was to promote the current crowdfunding initiative and to highlight the positive activity on the Hat site, and that has to be good news for the hobby, who would not want to see Hat as prolific once again as they have been in the past. I have a ProBoards forum and it costs nothing. There is only a charge if the ads are removed. They are still on the Hat forum so the site is free. If someone is paying then they're being ripped off. Look at the bottom of the page. Fred, the new one is free, the old one was not, and that is why it moved and changed, and to be honest I thought that was clear from my post. Chaps...Please stick to the subject at the head of the thread, namely the Crowdfunding of the dragoons. Maybe anyone could tell them that for four riders, only two horse poses aren't enough. And that Napoleonic cavalry isn't all about gallopping horses. Zed1 , well someone could tell them that, but will it change anything ? the sculpts were done years ago, and the time to ask for changes was then. So the offer is the existing sculpts done in 1/72 , support it and they are made, don`t support it and they are not made, and in that case we can ask and hope another manufacturer makes a set.....and how many sets of these have been made in the last fifty odd years of the hobby ? answer: none, 0 ,not one. So my advise is if you want British Dragoons 1808-14 support this, because you may not get another chance to get them. Well - I can't remember anyone asking questions about it. Do you? I'm still thinking about it. The dragoons might be worth a try. 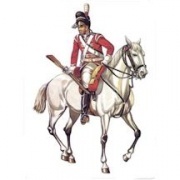 Although I'm thinking about switching those to Canadian dragoons for the war of 1812. Actually I can remember although a few years ago, and Hat have always asked before making any figures, just like they are now asking about, ACW command , Napoleonic Austrians and Hungarians , 7 yw Austrians , if would be fairer to say no other manufacturer asks for this much customer input before making figures. I cannot comment on if or why your posts were deleted, but I find it hard to believe they were ,or your emails ignored, but as our moderator has said lets stick to the subject ......crowdfunding Napoleonic British dragoons in 1/72. zulu`s 1000`s of em wrote: lets stick to the subject ......crowdfunding Napoleonic British dragoons in 1/72. I'm not a great fan of crowdfunding but if the two choices are crowdfunding or no figures, it's pretty clear which way you should jump. I appreciate the comment that units on standing or walking horses might be better. Which horses from other sets could you substitute to meet this demand? From the look of the line drawings of the Peninsular cavalry figures, they could either sit on such horses as they are or after a little modifying not look out of place on less active mounts. They are now at 3/10 so progress but still a long way to go, please support this and buy a set or two if you can, I for one would like to see these in 1/72. Me too and I have already pledged. But I am also still waiting for the Zulus and Landwehr. So I hope, in the end, they will bring it to and end for their customers.